How do Rivers Change Over Time? MOST RIVERS ORIGINATE IN HIGH ELEVATIONS LIKE MOUNTAINS. 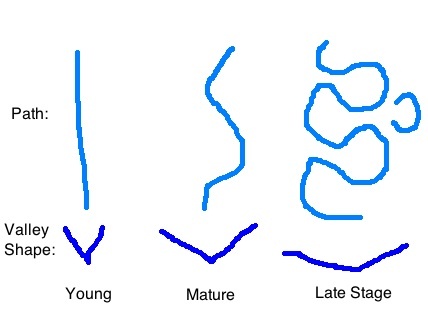 SINCE THEY FORM IN MOUNTAINS WITH STEEP SLOPES, MOST YOUNG RIVERS ARE FAST FLOWING. SINCE THEY ARE FAST FLOWING YOUNG RIVERS DO LOTS OF EROSION. THIS MAKES THE VALLEY SHAPE OF YOUNG RIVERS TO BE A V SHAPE WITH STEEP SIDES. Over a long time, the river keeps wearing away at the rock underneath it lowering the bed further and further. However, there is a limit to how deep a river can carve its bed. The river cannot cut its bed any lower than the level of the body water it empties into. So, for example, if the river flows into the ocean, it cannot have a bed that goes lower than sea level. BASE LEVEL IS THE LEVEL OF THE BODY OF WATER THE RIVER EMPTIES INTO. THE VALLEY SHAPE OF MATURE RIVERS IS V SHAPED BUT WITH A BROADER VALLY FLOOR, AND GETNLY SLOPING SIDES. AS RIVERS CONTINUE TO AGE, THEY CONTINUE TO SLOW DOWN. THIS MAKES THE RIVER TAKE AN EXTREMELY CURVY, OR MEANDERING PATH. ON THE SIDE OF THESE MEANDERING RIVERS WE FIND HORSESHOE SHAPED LAKES CALLED OXBOW LAKES. THESE FORM AS THE GIANT MEANDERING LOOPS ARE GRADUALLY CUT OFF FROM THE RIVERS PATH AS A RESULT OF EROSION AND DEPOSITION OCCURRING ON THE INSIDE AND OUTSIDE OF THE MEANDERING BENDS. 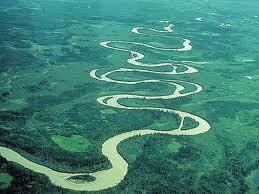 As the meanders continue to widen, they eventually become a loop. 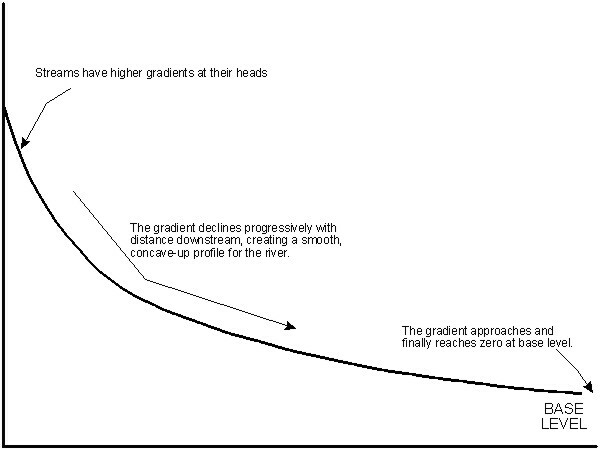 Eventually erosion at the first bend causes the river to cut through the loop cutting off the meander. Over time, deposition closes the first parts of the loop and a lake is created. These lakes are called oxbow lakes.